(i) definition of (1) Basic static load rating-static radial load or axial load which corresponds to a total permanent deformation of the ball and race,at the most heavily stressed contact,equal to 0.001times the ball diameter. (2) basic dynamic load rating- the constant stationary radial load or a constant axial load which a group of of apparently bearings with stationary outer ring can endure for a rating life of one million revolutions with only 10% failure. (3)Limiting speed- it is the empirically obtained value for the maximum speed at bearings can be continuously operated without failing from seizure or generation of excessive heat. List important physical characteristics of good bearing material. What are rolling contact bearings? State their advantages over sliding contact bearings. How do you express the life of bearings? The life of an individual bearing is defined as the total number of revolutions (or the number of hours at a given constant speed) which the bearing can complete before the evidence of fatigue failure develops on the balls or races.  The bearing life can be defined by rating life.  The rating life of a group of apparently identical bearing is defined as the number of revolutions (or the number of hours at a given constant speed) that 90 percent of a group of bearings will complete or exceed before the first evidence of fatigue failure develops. It is also known as L10 life. State any four applications of rolling contact bearings. (ii) How will select bearing from manufacturer catalogue? The following steps must be adopted in selecting the bearing from the manufacturer’s catalogue: 1. Calculate the radial and axial load reaction (Fa and Fr) acting on the bearing. 2. Decide the diameter of the shaft on which the bearing is to be mounted. 3. Select the proper size of bearing suitable for given application, specified with speed and available space. 4. Find the basic static rating Co of the selected bearing from the catalogue. 5. Calculate the ratio (Fa / VFr) and (Fa / Co). 6. Find the value of x and y i. e. radial and thrust factor from the catalogue. These values depend upon (Fa / VFr) and (Fa / Co). State any four advantages of ball bearings over plain journal bearings. 1) The ball bearings have a far smaller contact area and thus have a lower frictional drag coefficient. 2) Due to less frictional drag means better response and less power consumption. 3) The turbo can spool up much faster, which reduces turbo-lag and offers a major performance advantage over journal bearing turbochargers at lower to mid turbocharger speeds. 4) The reduced contact area of the ball bearings means that it requires far less lubrication, allowing for lower oil pressure feeds. 5) The ball bearing more reliable. 6) Less expensive. 7) Ball bearings generate less heat and require simple and inexpensive lubrication - by oil ring, oil mist, or oil bath method. Disadvantages of rolling bearing as compared to Journal Bearing: 1) Initial cost is very high 2) Noisy in normal operation. 3) Shock capacity is less. 4) Finite life due to failure by fatigue. 5) Dirt & metal chips can enter the bearing & may lead it to failure. 6) Occupies greater diametral space compared to journal bearing. State the steps involved in selection of a proper ball bearing from a manufacturer’s catalogue. 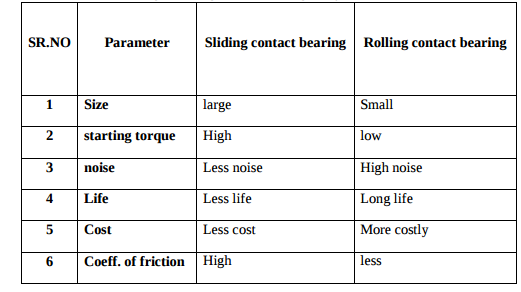 Differentiate between sliding contact and rolling contact type bearings. Explain the selection procedure of bearings from manufacturer’s catalogue. 1) Calculate radial and axial forces and determine dia. of shaft. 2) Select proper type of bearing. 3) Start with extra light series for given diagram go by trial of error method. 4) Find value of basic static capacity (co) of selected bearing from catalogue. 5) Calculate ratios Fa/VFr and Fa/Co. 6) Calculate values of radial and thrust factors. (X & Y) from catalogue. 7) For given application find value of load factor Ka from catalogue. 8) Calculate equivalent dynamic load using relation. Pe = (XVFr + YFA) Ka. 9) Decide expected life of bearing considering application. Express life in million revolutions L10. 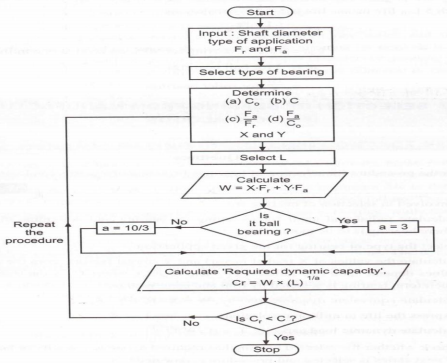 10) Calculate required basic dynamic capacity for bearing by relation. 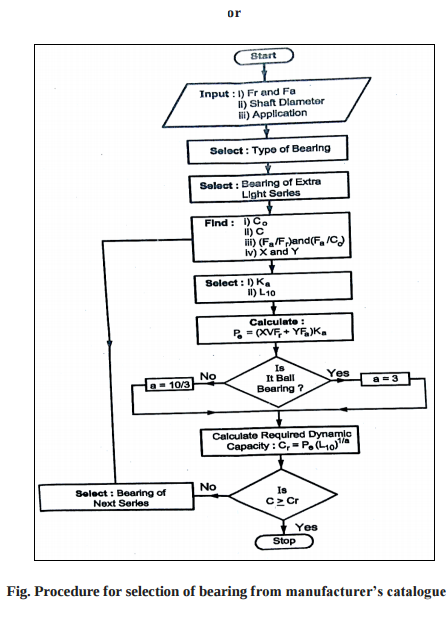 11) Check whether selected bearing has req. 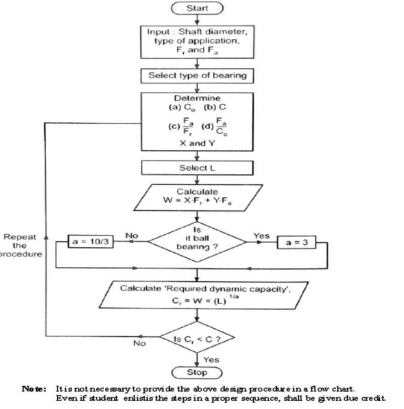 dynamic capacity, IF it not select the bearing of next series and repeat procedure from step-4. i) Deep Groove Ball bearing : Application: Electric Motor Reason: Capacity to take heavily axial load with high rotational speed ii) Taper roller bearing : Application: axle housing of automobile Reason: ability to take high radial load as well as thrust load iii) Thrust collar bearing: Application: Clutch of automobile Reason: ability to combine radial & axial load with min. speed iv) Needle roller bearing: Application: Differential of automobile Reason: takes less radial space. it has high radial load carrying capacity.